These were things we'd seen him in daily. 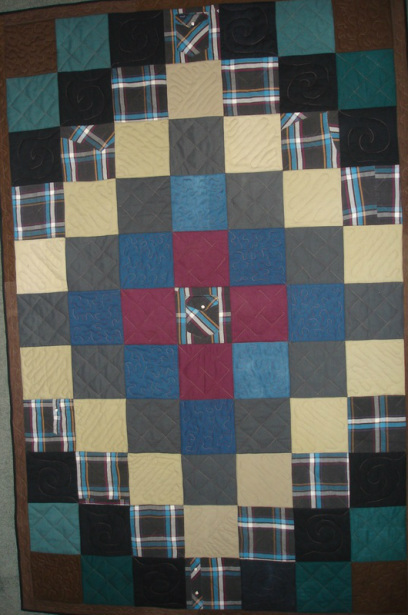 When my sister and I cleaned out his closet, the clothes were converted to cloth, to make memorial quilts for the family. There were only a few shirts that had survived his work days, but plenty of trousers. On my return to New Zealand, I put the fabric away waiting for a bit of time to pass. When mom became unwell and moved into care (with her sister) she had a single bed, so I put together this trip around the world. On my next trip around the world (back to Texas) I brought this for mom. Mom seemed quite moved and kept rubbing her hands over the plaid. She had ironed that shirt so many times. Now she could see and touch something familiar that reminded her of dad anytime. This quilt was no beauty, but it had real meaning for those of us who knew and loved this hard working man. Quilts should bring warmth and comfort. The younger of my brothers now has this in his home.